From here, figure out which "G" befits your father. Observation is key, so you have to put on your Sherlock Holmes hat, but the effort you put into this will be rewarding when he opens up the gift with the smile and appreciation he deserves. Road trips with the family, teaching you how to ride a bike and driving lessons. Memories with Dad cannot be traded for anything. This Father's Day I collaborated with my summer intern Savin Weerasinghe, University of Texas San Antonio Student and English Major, to highlight the perfect gifts to give to the fathers that have filled our lives with laughter and love. First, what's "Gardens"? We're in an era when men can have an interest in growing flowers, herbs -some form of horticulture, and they can do it without society's critiquing glare. Take advantage of this. Does he primarily plant flowers, maybe he's growing a vegetable and fruit garden, or perhaps he enjoys creating fantastic bonsai or topiary from trimming bushes and trees? Take a look around his garden tools, see if he needs a replacement tool. Do a bit of research to see what he may be missing. The sales associates in garden ware at Home Depot or Lowe's, or a local hardware store like Breed & Co. can give you inside tips and ideas. If he's been pondering about planting a new vegetable or fruit, buy him his favorite. This is important: be sure you buy seeds that are in season, both for flowers and for plants. It's already great fun to plant your own seeds and see them grow, and it'll be better when it's a joint effort as you spend the day gardening with your dad. Next, let's look at "Grills." 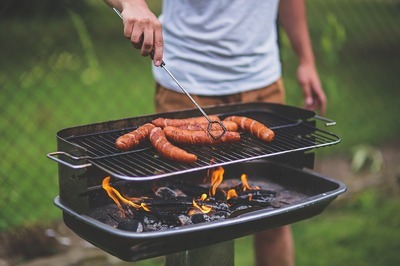 There's a lot going for a griller's favorite pastime. You can look at cutlery, cookware, décor, food, the list is quite long. Investigate his grill and tools, or see if he could use a new grill or tableware. Look into a quality Weber or Broil-mate with a lasting warranty. Don't get him a propane tank. It's dangerous and he won't laugh at the joke. But wood chips or briquettes for grill have been good gifts. Another good investment would be a YETI which is durable against any environment and has a great storage space. Now if he's set to go for the next BBQ cookout, purchase his favorite food for the grill. He'll enjoy heating up the grill and it'll be a pleasant atmosphere for family and friends. Imagine the smoky brisket wafting past every house in the neighborhood, watching your dad playing around with new tools, a new apron - it's a mirthful Kodak moment. Now, my dear Watson, what if he doesn't cook nor garden, what then? Gadgets, of course! If he isn't part of the first two G's and you still don't know what to get him, he's probably tech savvy. If not, then it's about time to teach him new tricks. Check to see what's new on the market. Maybe a Bluetooth headset or a Fitbit? Perhaps a wireless speaker or get him into VR. The technology realm is expansive and ever-growing, so ponder the right item that he will use. There are many different opportunities to find just the right Fathers' Day gift, even though every dad has his own tastes. Give thanks to the paternal figure that guided you through thick and thin whether he's the figure at home, at work, or at school. He could be an uncle, brother, a stepfather, grandfather, or even a mentor. Make sure he knows how much you respect and appreciate him. Savin Weera is a Summer Intern with Protocol & Etiquette Worldwide. He is currently a student at the University of Texas at San Antonio studying for a B.A. in English with Concentrations in Professional and Creative Writing. Feel free to connect with Savin on LinkedIn.